Our most comprehensive and powerful separation software, TRAX Pro SP includes access to the latest breakthroughs in automated speech separation as well as the entire TRAX Pro feature set. Recommended for isolating speech from full soundtracks, dialogue editing and easy denoising, audio restoration and professional vocal and instrument isolations. Isolate or remove speech from archived content, opening up possibilities for redubbing, remixing and releasing titles. Gain the most advanced access to vocals, speech and lead melodies within mono or stereo files – whether you work in post or music, TRAX Pro 3 SP offers the most advanced solution. Precisely edit and refine files with the integrated, fully conservative spectral editor. Separate, isolate or remove speech from full mixes. Equip your edit rooms and re-recording stages with the most advanced speech and melodic separation technology. 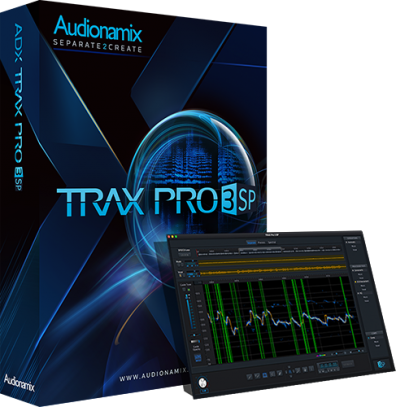 The new speech separation capabilities added to ADX TRAX Pro 3 SP makes an already great application even more versatile and powerful. I highly recommend ADX TRAX Pro 3 SP to those with an interest in upmixing mono source material to stereo! As a post-centric studio, we are very excited about the possibilities that TRAX Pro SP offers for saving troublesome production dialogue without the need for ADR. The fact that TRAX SP can identify speech automatically saves us valuable time and our clients’ money. THIS SOFTWARE IS FOR MAC OS ONLY. IT IS NOT COMPATIBLE WITH WINDOWS MACHINES. To ensure your subscription is fully cancelled and that you aren't charged again, please cancel your recurring payment through PayPal here. To do so, click on the Audionamix merchant payment and then Cancel at the top-left of the page. If you have any questions or issues with the cancellation process, please reach out to support@audionamix.com.